Is that the best he has been able to do? Hey, it was a saturday night :) Give him a break…. Tony – you need to rename your website to the National Center for Real Climate Science. More open minded people need to read your posts and these so-called experts need to respond to their exposed fraud! Stop right there, oars. Remember, first do no harm. Most of the people reading The New York Times are Progressive Democrats and Hillary voters. They have been in extreme pain for over 10 months. A sudden change in light, a sharp sound, or even a change of font will startle them. Tony is unable to shield them from coming to this blog. We have to adjust to their ability to comprehend and go slow when introducing new stimulants or they will become unstable. We may have to intervene and provide safe spaces in which we can isolate them if they suffer a violent allergic reaction. 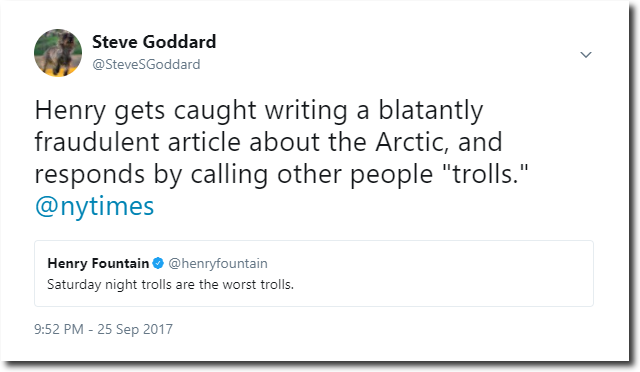 I believe that renaming the blog would needlessly endanger them but a possible first step could be the National Center for Really Deplorable Climate Science as long as vulnerable Progressive alarmists can be properly supervised during the transition. I’m just stunned that a liberal would go and name call/generalize like that. Too bad he isn’t a she as you’d have then been called a misogynist. Even better, a black female and you’d have got the trifecta of being called a racist misogynistic troll. Just remember that facts are like kryptonite to most liberals. Then he”d be called a mysogenist,racist,homophob transphob. and indoctrinated to react when they are exposed to specific patterns and how they are triggered by them. and noone would dare to say a word. Yes it is rather humorous coming from the party of FDR who appointed Hugo Black, famous KKK member to the Supreme Court, and who interned American citizens and confiscated their wealth during WWII, of Algore who got his wealth from growing tobacco and whose father was a raging racist/segregationist, the party who has sanctified Robert Byrd, Grand Wizard of the KKK, the party of Jim Crow. Again this is as much an indictment of the public school system as it is of the hypocritical Dem party. Tony did you notice NDSIC changed their graph of the Arctic from yesterday to today? Using interquartile and interdecile range rather than + or – 2 standard deviations? That happened in February or March of this year. I’ve been looking at this which shows the original. First time I’ve went to the site. Thanks. https://sites.google.com/site/arcticseaicegraphs/ 1st on the left 2 down. Tony, you did troll the available data and caught them at their game. So you are kind of a troll that way and quite a fishermen, good work. “Troll”- translated:I can’t refute what Tony says, so instead I’ll name-call. Brilliant! When the ad hominems start spewing, you know you have won the argument. Try asking something much simpler first, “What is the composition of air and, in particular, how much is carbon dioxide?” Most people don’t have a clue. Hell, I would bet money that the majority would answer that oxygen makes up the majority of the atmosphere.